We are always looking for new volunteers. If you would like to join the fire department, or just want to familiarize yourself with what we do, contact the Fire Chief (Colin O’Neill 668-6613) or Deputy Fire Chief (Jeff Boyd 334-7683). They will tell you the best time to come to the firehall. We are located at #21 Robinson Road, the first building on the right in the Robinson Subdivision. Anyone over the age of 18 can become a firefighter. Junior members aged 16 – 18 are welcome to train and learn new skills through the Explorer program, but they are not permitted to engage in any front line fire fighting. However, their training provides a sound basis for future participation in the MLVFD. Joining the MLVFD is a commitment. Members are expected to attend a minimum of 12 of the approximately 48 trainings held over a one-year period. This is to ensure that they stay current with the fire department’s Standard Operating Procedures and remain familiar with equipment when responding to a call. Currently, the MLVFD trains 4 times a month on Wednesday evenings from 1900 to approximately 2130. Two of these trainings are not mandated by the Fire Marshal’s Office, but we feel we need the extra trainings to keep us ready to respond to emergencies and to do all the maintenance and checks on our equipment. 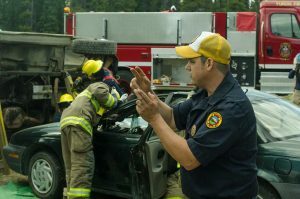 Firefighters are trained to respond to structural fires, brush fires and motor vehicle incidents, including vehicle extrication. Dispatchers assist fire fighters by providing communication services from the firehall’s radio room during incidents. They provide a link between responders at an incident and any other services that may be required. Other non-firefighter members can provide aid and support when there is a prolonged incident. This can be as simple as providing snacks and hot/cold beverages for firefighters and other emergency responders. Volunteers are paid $22.00 for each training session, and once they are qualified to respond to incidents they receive $22.00 / hr while responding. Additional life / disability insurance over and above WCB coverage, is purchased by the MLVFD Society for all our volunteers. In addition to this, volunteer firefighters and society board members can, at a very reasonable price, purchase 24 hour off-duty insurance for themselves and family members.